Place a spoonful of ice cream into a mini glass and top with a dollop of whipped topping. Top with a layer of strawberries, another spoonful of ice cream, a dollop of whipped topping and another layer of strawberries. To make Strawberry-Blueberry Sauce: In a blender, puree 1 cup sliced strawberries, 1 cup blueberries, and ¼ cup sugar. Pour into a small saucepan, bring to a boil and simmer until sugar dissolves. Remove from heat and chill 30 minutes. 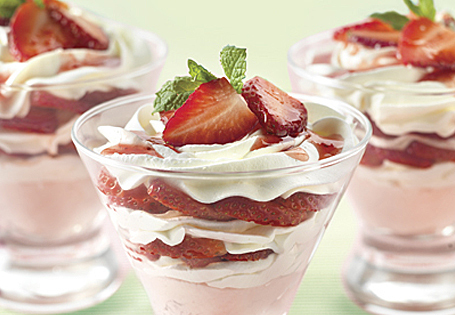 Drizzle sauce on top of each strawberry cream cup. TIP: Assemble in clear shot glasses, espresso cups, small bowls or parfait glasses.